Education, Health and Care Plans are replacing Statements and Learning Difficulty Assessments and are for children and young people with more severe/complex needs and disabilities. EHCPs bring together your child’s learning, health and social care needs in one plan. They can continue until a young person is aged 25 but if they stay in further education or training. The transfer of statements to EHCPs has beenphased over three years and is due to be completed by 2018. View the Cambridgeshire timetable for when the transfers will take place. Pinpoint and parents have been helping to draft new guidance on the assessment process in Cambridgeshire. It’s just been published and is now being reviewed by parents and other interested parties. The consultation runs until October 2018 — find out how to read the new draft guidance and give your feedback to make the whole process easier and more transparent for families. Refused an EHC Needs Assessment? IPSEA, the Independent Parental Special Education Advice, offers free and independent legally based information, advice and support to help get the right education for children and young people with all kinds of special educational needs and disabilities (SEND). It has now produced a “refusal to assess” pack for parents wanting to appeal local authorities’ refusal to carry out EHC needs assessments. One team covers assessments/reviews and transfer to/maintaining EHCPlans. The second covers commissioning and specialist resourcing, including EHCP finance, the county resourcing panel and SEND/LAC transport. 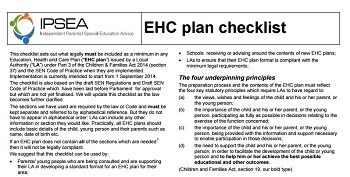 If your child or young person has an Education, Health and Care Plan (EHCP), it should be reviewed every year at least. To help parents and young people understand the reviewprocess, Council for Disabled Children has produced an Annual Review Factsheet, step-by-step timeline and guidance notes for experienced Independent Supporters who may support a parent or young people with an Annual Review.